A number of scientists are looking at ways to boost activity in the prefrontal cortex to regulate food consumption, from exercise to brain-training activities to brain stimulation. Their research suggests the future of treating and preventing obesity may include targeting the brain, not just the stomach. If you’re worried about gaining weight, exercise may help – and not just by burning calories. Exercise may strengthen your brain’s ability to resist high-calorie foods such as potato chips and chocolate bars in favour of more healthful options. 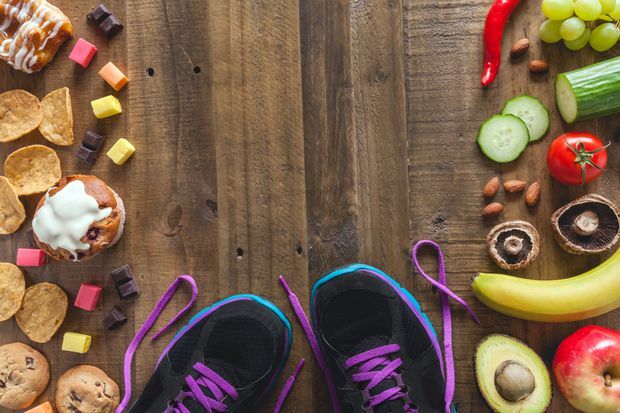 It’s an idea being explored by Dr. Cassandra Lowe, a postdoctoral fellow of the University of Western Ontario’s BrainSCAN program: How to tackle obesity by improving the brain’s dietary decision-making. In a recent review article, published in the journal Trends in Cognitive Sciences, Lowe and her colleagues examined the relationship between obesity and the prefrontal cortex, an area of the brain involved in planning and inhibitory control. That relationship, they reported, appears to be reciprocal; people who have reduced activity in the prefrontal cortex are more likely to overeat highly processed, calorie-dense foods. In turn, overeating these foods changes their brains to increase the likelihood of overeating. To disrupt this cycle, she is among a number of scientists who are looking at ways to boost activity in the prefrontal cortex to regulate food consumption, from exercise to brain-training activities to brain stimulation. Their research suggests the future of treating and preventing obesity may include targeting the brain, not just the stomach. “It’s really important that we … consider the prefrontal cortex when we’re thinking of preventative measures because there are lots of ways that we can kind of improve our executive functions,” Lowe says, adding exercise appears to be one of the best. Not only do people who engage in regular exercise tend to have better executive functioning, she says, exercise has been shown to change the structure and function of brain regions, such as the hippocampus, which is involved in memory, and the prefrontal cortex. Now, Lowe intends to study whether exercise can increase brain activity in adolescents as an early preventative measure against obesity. At the Oregon Research Institute, a charitable research centre that focuses on healthy behaviour change, scientist Dr. Sonja Yokum has been testing whether brain-training tasks can help treat obesity. In a pilot study involving 47 overweight and obese adults, published in 2017 in the journal Behaviour Research and Therapy, Yokum and her team found those who received special training aimed at changing their reaction to high-calorie foods lost more body fat over a four-week period, compared with the control group. In brain scans, those who received the special training also showed reductions in the reward and attention regions of their brains in response to images of high-calorie foods. Their training involved a series of computer tasks, aimed at inhibiting their response to high-calorie foods and directing their attention to low-calorie foods. In one task, participants practised picking out an image of low-calorie foods, such as a carrot and cucumber slices, as quickly as possible from among several images of high-calorie foods, such as cakes, burgers and cookies. Another exercise asked them to quickly push a button whenever images framed by a dark blue border, which were always of low-calorie foods, flashed up on screen, but to refrain from responding whenever images framed by a light grey border, which were always of high-calorie foods, appeared. While the research team noted several limitations to their study, including its small sample size, they suggested this type of computer training has some advantages over standard weight-loss interventions. Not only is it cost-effective, they wrote, it aims to directly change some of the automatic thoughts that lead to overeating. At the University of Waterloo, however, Dr. Peter Hall says he is skeptical brain-training exercises can effectively change what and how much people eat. While people may get better at performing the tasks on which they’re trained, these improvements do not tend to carry over to everyday life, says Hall, a professor in the school of public health and health systems and a co-author of the Trends in Cognitive Sciences paper with Lowe. There is, however, good evidence to suggest brain stimulation, which involves the use of magnetic or electric currents to influence brain activity, can regulate food cravings and change food consumption, he says. But, he adds, the application of brain stimulation as a potential treatment would likely only be reserved for extreme cases, such as when a patient is morbidly obese and faces life-threatening conditions related to obesity. “Under conditions where someone might seek bariatric surgery, for example, it might one day become a viable alternative, or something that’s used with bariatric surgery to prevent the regain of weight,” he says. In the meantime, what scientists are now learning about the brain’s role in obesity provides reinforcement for existing public health recommendations around obesity prevention, Hall says. For instance, it provides greater justification for increasing the availability of healthier food options and decreasing the availability of less healthy ones to make it less taxing on the brain’s self-regulatory networks, he says. It also emphasizes the need to pay attention to people’s total lifestyles, since exercise, sleep, and stress exposure all have implications for brain health. “To the extent that brain health is optimized, people are going to be able to live healthier lives in general,” Hall says.